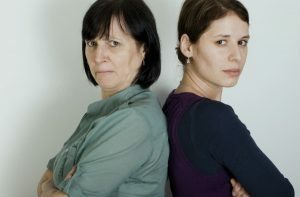 I begged my daughter Lisa not to have the abortion. I called my Parish Priest, Fr. Dominick. He rushed to the hospital to try and persuade Lisa to change her mind. Father gave her a rosary blessed by Pope John Paul, and spoke of what a gift this child would be to the family. Lisa walked away from the priest in tears and went into the procedure room to allow the doctors and nurses to end the life of my grandchild. I cannot explain the level of grief and anger that flooded my heart and soul. I was filled with rage at the hospital and all involved with the procedure. But I was most hurt by my daughter going through with the abortion even after I pleaded with her to give life to this child. My mother and father have always been very close to my children and they were aware of the abortion. They were deeply grieved by the loss of their great-grandchild and heartbroken for Lisa. When my mother learned of the abortion she prayed immediately and asked her deceased dad to receive the baby since the child died on my grandfather Adam’s birth date. Shortly after the abortion I went to talk to Fr. Dominick. After I shared my pain, he suggested I consider a Rachel’s Vineyard Weekend, a program of emotional and spiritual healing for individuals and families suffering after abortion loss. The Rachel’s Vineyard Retreat was a powerful experience of healing and went to the heart of my post abortion trauma and grief. The weekend helped me to find peace and closure. I formed a number of close friendships from that weekend and the follow up support group meetings. She knew of my Rachel’s Vineyard experience and my friends from the retreat. Lisa would react with cynicism and mock my “abortion friends.” But beneath that defensive behavior, she was hurting and in need of healing. Six months after the abortion, my son asked Lisa to be the Godmother of his baby boy. This event triggered a release of her pent up post abortion grief and pain and Lisa suffered a nervous breakdown requiring hospitalization. She recovered from the breakdown, but remained deeply wounded. I was blessed to be able to attend the memorial service on Sunday of my daughter’s weekend when participants honor the children with a special ceremony and Mass. When I opened the memorial service program I looked over the list of names of the babies being entrusted to the Lord. I knew right away the name Lisa had given my grandchild – Dominick Leonard. Lisa named the baby after the priest, Fr. Dominick who had been so kind to her and who tried to stop the abortion – and after the abortion continued to reflect the love and mercy of Christ to my daughter. She gave the baby the middle name of Leonard after my dad, who Lisa loves dearly. This memorial service was deeply painful but it was the suffering of the cross, with the faith and hope of the resurrection. We trust that Dominic is alive with the Lord. We grieved and honored the child together. This was a time of grace and healing of our relationship which had been so deeply damaged by the abortion. For the next 6 years I had the privilege of serving in various capacities on the Rachel’s Vineyard Retreats offered by the Archdiocese of Newark. I encourage any grandparent suffering after the loss of a grandchild to abortion to consider if a healing program would help you find peace and bless your family. This entry was posted on Wednesday, March 8th, 2017 at 5:17 pm	and is filed under Uncategorized. You can follow any responses to this entry through the RSS 2.0 feed. You can leave a response, or trackback from your own site.